Nice sink. Keep in mind it’s a little shallow. Dimensions 19.3 In. X 11.8 In. X 5.0 In. VERY SHALLOW- watch what type of faucet you get!! I bought this for a small bathroom--put it on top of a little hand-painted cupboard and installed a wall mount faucet over the top of it. This set up is beautiful--and the sink is very well made. However, it is very shallow--so we have splashing problems and have had to turn the water valve nearly shut to keep the water at a very slow flow rate into this thing. Watch what faucet you get with this, because otherwise splashing will definitely be an issue! Othat than that problem, the sink is heavy, very nice finish, true to color, and high quality look. This vessel sink goes with any decor. I had it installed on an antique dresser as my new bathroom vanity. The only con is that you have to watch how the water may splash out behind it when washing your face, or hands. For me, by myself it works great, and I just leave a pretty washcloth on the corner of it to wipe splashes when needed. Be sure and purchase a faucet that is tall enough and extends out to the middle of the sink over the drain. One can't really go wrong with purchasing this sink. 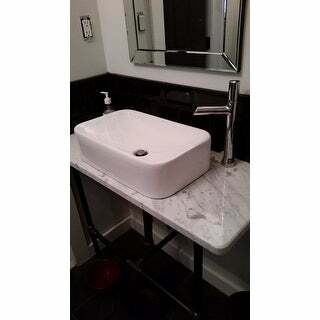 We paired this with a nightstand from *** and Kraus vessel faucet to make a vanity/sink in our only bathroom. Looks like a million bucks, performs well, and...well....looks like a million bucks. Two main issues--the "bowl" seems to be a little shallow and the popup drain that's included doesn't install properly. The former is really a preference thing, but it's not so shallow that water splashes everywhere. The latter, however, is a design flaw in the concave rubber washer included with the popup drain. Long story short, when the drain is installed per instructions, the rubber washer leaves a lip that will allow water to pool up and not drain completely. Solution--ditch the concave washer and use good old fashioned plumber's putty. Worked like a champ--clean and functional installation after that snaffu. Highly recommended. We needed a sink for a narrow bathroom. This one fit just right. The give back with a small sink is splashing. I initially tried the faucet on the end but that was ment that hand washing was done way over to the side of the sink instead of the middle. I saw lots of messes to clean up, so I moved it behind the sink for much better results. Installing the drain is different because it's a vessel sink - It seems weird to mount the drain with the counter top between the drain and sink, but that was the process. No leaks! This sink in my bathroom continually gets wonderful comments. The plumber just sort of looked at it astounded in combination with a wall mount faucet:) It does tend to splash more than inset sinks I have had. I turned it around so the Kraus logo isn't obvious. It is the perfect sink for my newly done bathroom. I love these sinks! After much searching and reviewing, I bought these for my master bath re-do and installed December 2010. They are unique and look great! I wanted something white and different from the 'round' vessel sinks I saw everywhere....the shape is nice and easy to clean. The drains came with it, work fine. The only thing that I was a little disappointed about was the 'Kraus' printed name on the back, middle area was a bit off center on one of the sinks. My plumber pointed it out to me, I hadn't even noticed it. Not a big deal, just wanted to point it out. Overall beautiful sinks at a great price. FYI: I bought my faucets for these sinks on here as well, "Chrome Vessel Bathroom Faucet" was the title of the item. They look great and work very well. I purchased this sink to go with my existing 20x55 bathroom cabinet, and the size of this sink fits perfectly. The sink was actually better than I expected. Nice and heavy, and you can tell the product is of high quality. Water spots hardly even show, and with a quick wipe they come right up with no scrubbing. I wanted a rectangle vessel sink, but did not want the traditional "box" type due to issues I've read with poor water drainage. This sink curves towards the drain so the water drains perfectly. A great addition to your bathroom! The only thing I would recommend is to wrap the drain pipe with sealing tape. The plumber did not do this initially, and I had some leaking, but as soon as I applied the sealing tape, the leak stopped. Plumber's fault, not manufacturer. I love this sink. I purchased 2 for my bathroom vanity. I do like it that the bottom is not completely flat, so that it drains well. Product seems to be very well made. I needed drains in a different finish and was easily able to find them for a reasonable price online. Great sinks. Nice size and finish. This sink is beautiful and extremely well made. It is shallow, if a little splash doesn't bother you....other than that....it's perfect! I included a picture of mine!. This sink is very nice . It was a little shallower than i expected but love the look. Perfect size for my very small bathroom. I had 15" of cabinet depth to work with. I ended up putting the faucet of to one side so everything would fit. Loved this sink! This was nicely weighty and looked expensive. Good purchase. Very nice small sink great fir a small powder room! Love this! I ordered two! I had this mounted on a Victorian dresser. I just love the look! It’s shallow, but we really only use the sink for brushing our teeth and hand washing so it’s perfect. This sink is kinda small but we did 2 in the master bath so they will work fine. I love this sink! I remodeled a bathroom and thought I would save space and only install one sink which would give me more counter space. The sink looks great and small enough not to take up so much space so I went ahead and ordered a second one. "Is the drain included ?" I'm pretty sure a drain was included. But when I ordered a faucet that came with a drain as well. The drain that is included is chrome so if you are using a different color faucet, you will need to order that color drain. "What are the actual dimensions of the sink?" "What is the diameter for the drain hole?" Hello mkneumann, this sink has a standard 1.75 inch drain opening. Thanks for shopping with us! "Details state "includes hardware". Does this mean that the drain is included? And if not, what size is the drain hole?" 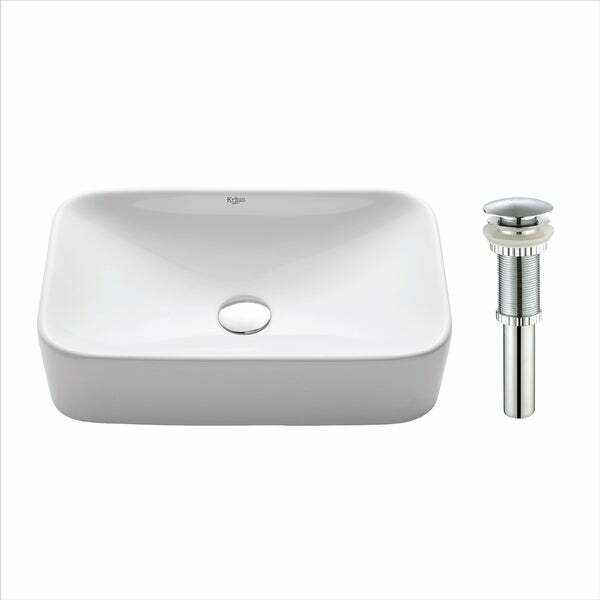 Hello mkneumann, the sink does not include the pop up drain and has a standard 1.75 inch drain opening. Thanks for shopping with us! "Does this sink have an overflow hole?" Hello homma, no, it does not have an overflow. Thank you for shopping with us! Needed a small vessel sink. The customer feedback seemed to indicate this product would fit my needs. "How deep is interior of sink?" Not very! Maybe 3-4 inches at deepest point. Make sure your faucet is close and centered. We did a wall mount faucet with it and had to nearly close the valve so the water didn't run very fast or it splashed all over! I opted to answer this question not with measurements but with how I utilize the sink. Deep enough to wash your face, shave or wash a small hand washable item without making a water mess on your surroundings. The slope is perfect. I placed this sink on top of a Pier1 cabinet and used a vessel faucet. If you turn on the water full blast (high pressure) you might have a problem.